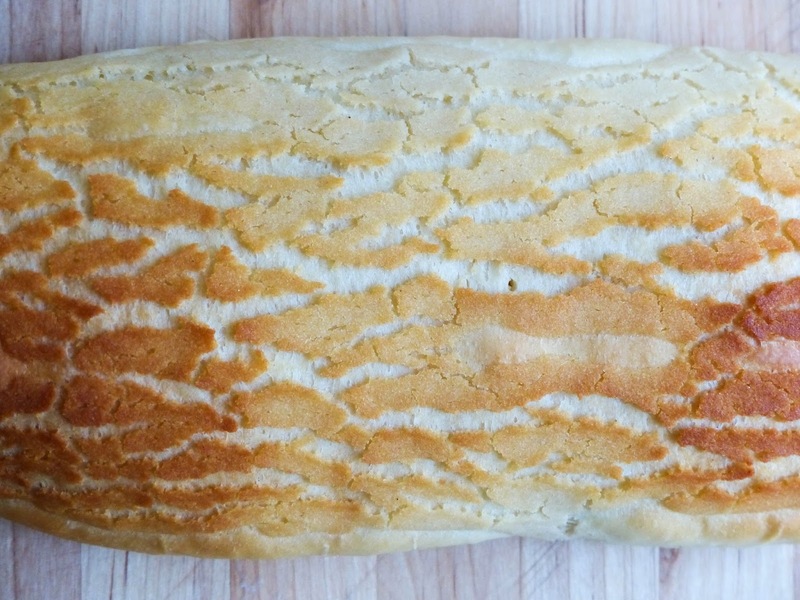 This unique looking bread gets its name from the crunchy topping and the pattern it makes. 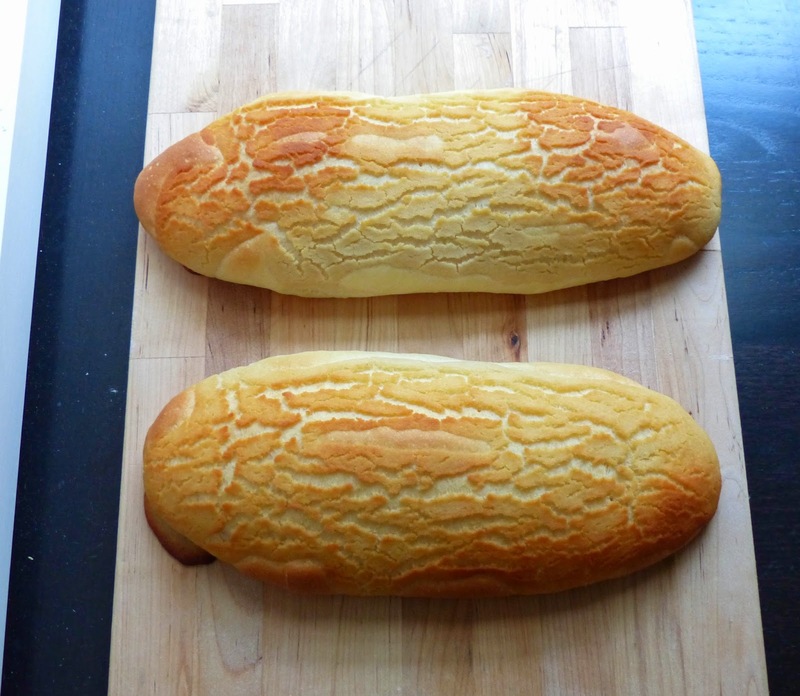 The bread is popular in San Francisco, but it's originally from the Netherlands, where it's called tiger bread. Hence the name, Dutch Crunch. It's used for sandwiches, and every deli and sandwich shop in the city offers it. 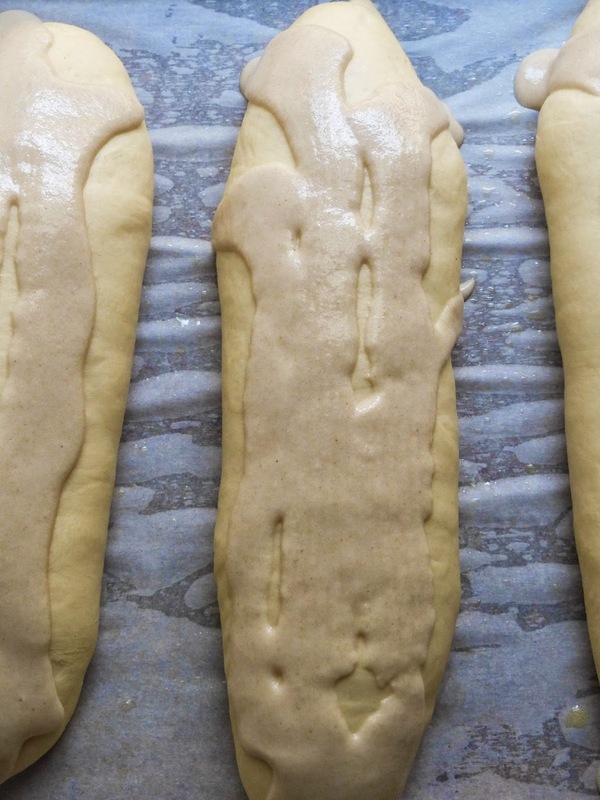 The topping is made from rice flour and yeast and is piped on to the baguette before baking. It dries in the oven and leaves a striped crunchy exterior, which is a nice complement to the soft bread. Dutch Crunch is my favorite kind of bread for sandwiches. There's this amazing sandwich place we go to all the time, and that's always what I get. The crunchy top is perfect, because most sandwiches lack that crunchy element. 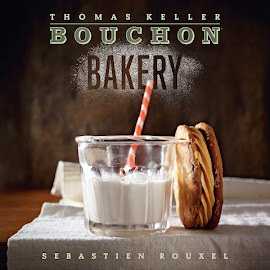 So I was glad when I saw this recipe in the book, because I never knew how it was made. The bread itself was easy, much like the pain au lait from last week, but shaped into demi-baguettes. Instead of proofing them on linen and baking them on the stone, they were proofed and baked on a baking sheet. I guess the dough was too delicate to be moved. While the dough was proofing, I made the topping. It's mostly rice flour, yeast, a little bit of sugar, and oil. I was about 10 grams short on the rice flour, so I added some regular flour to make up the weight. The mixture was super runny, and I don't think it should have been. The picture in the book appears much thicker, and it was difficult to pipe. It ran all down the sides of the bread and I was worried that it wouldn't bake up crunchy. But it did! 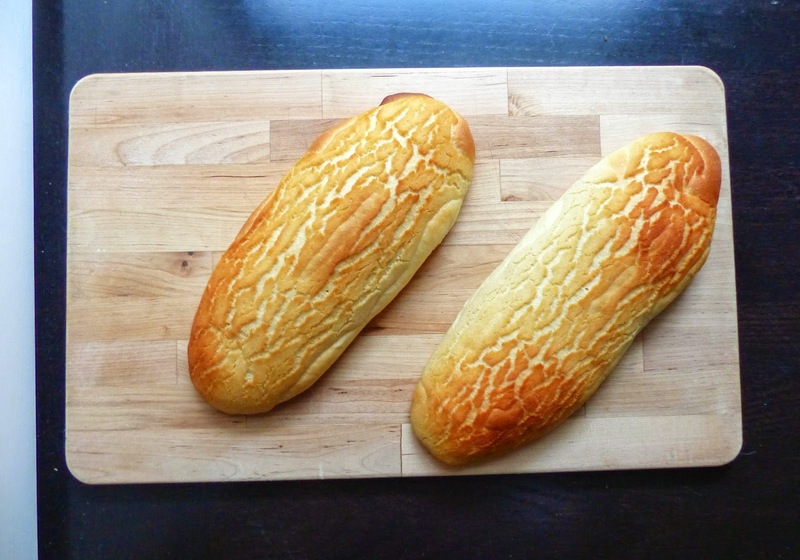 After baking for 30 minutes, the loaves were golden and striped and beautiful. My oven has been baking a bit unevenly, so I rotated the pan once to try and even out the heat. But one loaf ended up much darker anyways. Later that day, I sliced open a loaf to make a sandwich. The crumb was soft and even. 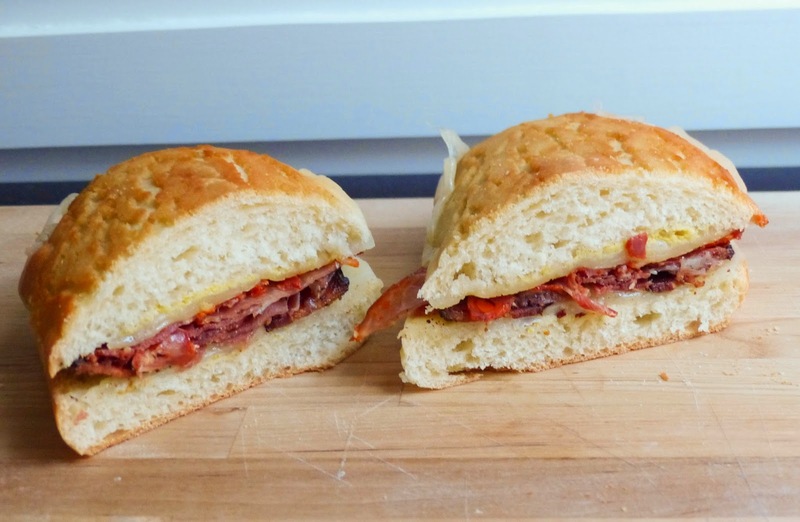 I layered mustard, provolone cheese, and a variety of Spanish cured meats, then toasted the sandwich. It was super tasty! My favorite Dutch Crunch did not disappoint. The rest of the baguettes I'm saving in the freezer for a rainy day when I need a tasty sandwich. I'd definitely make this one again.